Steel chain in edge hem all around keeps wind from getting under tarp, stays down even in high winds. Field proven to 65mph. Industrial 18 mil vinyl-polyester fabric with UV and mildew inhibitors. 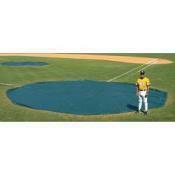 Major League Style, rounded to fit inside dirt circle for extended use in sun and for optimum dirt moisture management. thousands used by all levels of baseball from Youth to the Majors. 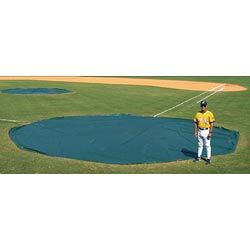 Tarps protected by 3 patents and a 2 Year Limited Warranty. Standard Color: Forest Green. Custom Colors are available please call for a quotation.